In 2002 TBCC established the Emergency Access Fund to provide financial assistance to individual in financial need due to inability to work and or mounting medical expenses incurred while undergoing treatment of breast cancer. This fund is designed to partner with other established community agencies to provide quick turn-around funding. This fund has provided assistance in preventing evictions, paying utilities, insurance and medical necessities. TBCC partnered with and provided funding for the St. Thomas Latino Breast Health Outreach program targeting a large Hispanic population in Nashville. Funding for this program helps to provide free screening mammograms, diagnostic mammograms and ultrasound tests when needed for indigent/uninsured clinic patients. This program also provides health education by addressing issues of healthy lifestyle, cancer prevention, early cancer detection, screening guidelines and mechanics of breast self-exams. The program is the second of its kind to be established by St. Thomas, providing a much-needed facility for the underserved in Middle Tennessee. TBCC provided financial support to the Cool Springs and Maryland Farms YMCA After Breast Cancer (ABC) program. This program provides nutritional counseling, emotional support and exercise programs for breast cancer patients and survivors. Support was also provided to establish a library and an Outreach Resource Center with 2 computers for internet based research. This program has received national recognition and has become a model for similar programs in Tennessee and other states. TBCC provided financial support to the YMCA ABC program in Rutherford County and Clarksville, modeled after the Cool Spring’s program. More programs such as this are planned in the near future. TBCC has provided financial support to the operating budget of Gilda’s Club Nashville. The purpose of Gilda’s Club is to offer to their member’s lectures, workshops, classes, support groups and social activities in a non-residential, homelike setting. Free of charge to everyone, Gilda’s Club Nashville provides a gathering place where people with cancer and their families and friends can join with others to actively involve themselves in building social and emotional support as a supplement to regular medical care. Over 50% of the families are coping with breast cancer. TBCC provided $50,000 towards Gilda’s Club Building Fund in 2006 and financial support through Grants that allow Gilda's Club of Nashville to offer workshops, classes, social activities and support groups in a homelike setting to breast cancer patients and their families. TBCC provided funding for the Vanderbilt-Ingram Family Cancer Risk Services. This program works with at risk women to determine genetic risk factors and provide counseling services. The Family Cancer Risk Service (FCRS) is an educational consultation service provided by a nurse practitioner and genetic counselor, working with other medical specialists. The combination of a nurse practitioner and a genetic counselor that have special training, experience, and interest in cancer risk assessment provide a unique and much-needed resource to the community. TBCC sponsored Sister’s Network Nashville’s breast cancer benefit, entitled “Sister Survivor: The Prologue”. Sister’s Network is an African American Breast Cancer Survivorship organization. TBCC distributed educational material regarding breast care, diagnosis of breast cancer, treatment options, resource organizations, etc. to hundreds of women through various education events. Some of these events included the American Artisan Festival, Low-Country Boil Breast Cancer Event, Tennessee State Employees Breast Cancer Ceremony, Bridgestone/Firestone Employee Volunteer Day, Ambulatory Surgery Nursing Educational Conference, NBLIC Cancer Awareness Day and Doubling Up for the Cure Tennis Tournament. TBCC awarded scholarships to local survivors and advocates to attend the National Breast Cancer Coalition Annual Advocacy Training Conference in Washington, D.C. During this conference, participants attended workshops conducted by the country’s leading doctors and scientists in the medical aspects of breast cancer. They also attended workshops on becoming effective grassroots advocates and educators for their communities. The last day of the conference was spent meeting with Tennessee representatives and senators concerning current legislation regarding breast cancer issues. TBCC has an established relationship with the Community Foundation of Middle Tennessee to provide various grants through endowment funds. The endowment funds allow the Coalition to contribute and serve the community. Carin’ and Sharin’ – a breast cancer support group provides education and empowerment to women in inner city Memphis; the Hats Off To Breast Cancer program utilizes storytelling to stress the importance of breast health through culturally sensitive experiences about breast care, treatment and survivorship among a medically underserved population. Friend in General – Nashville General Hospital will host its 9th annual Mammograms in May program which provides free screening mammograms as well as necessary follow-up care for uninsured women over the age of 40. This successful program will provide approximately 500 free mammograms to women who would otherwise have no access to breast screening. YMCA’s ABC (After Breast Cancer) Program – a comprehensive wellness program for patients and survivors of breast cancer that includes exercise training, nutrition guidance, lymphedema treatment and emotional support. Free of charge to all Middle Tennessee residents. Pink Ribbon Project emphasizes the need to focus on underserved populations in the 14 counties of the Upper Cumberland Region – Hispanic, African-American and the rural, poor. This culturally sensitive breast health awareness, education and screening project provides screening and diagnostic mammograms to remote, rural communities. Carin’ and Sharin’ – a breast cancer support group providing education and empowerment to women in inner city Memphis. Friend in General – Nashville General Hospital will host its 8th annual Mammograms in May program which provides free screening mammograms as well as necessary follow-up care for uninsured women over the age of 40. Gilda’s Club Nashville – provides emotional and social support as well as education to breast cancer patients and their families through a wide variety of programming and activities. Mtn. 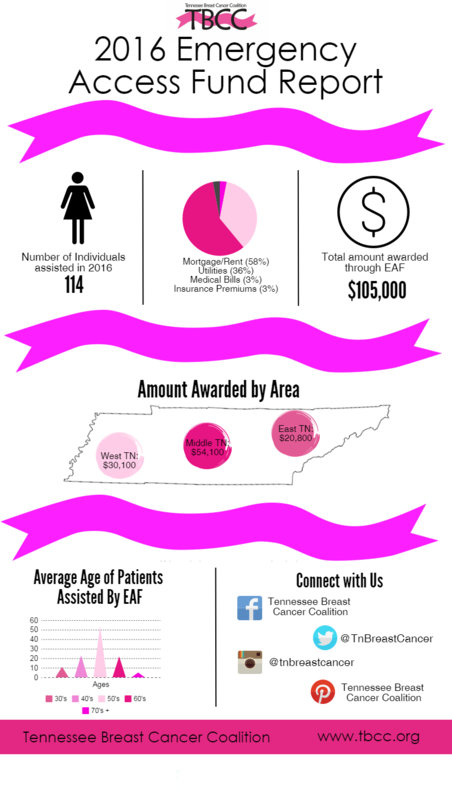 States Health Alliance – 30 trained nurses will provide breast cancer awareness education to rural, undeserved Tennessee communities that are in south and central Appalachia. YMCA’s ABC (After Breast Cancer) Program – a successful 16-week program for breast cancer patients containing exercise training, nutrition guidance, lymphedema treatment and emotional support.